Jewel-like and bursting with tangy, bright flavors, oranges seem almost out of place in the middle of winter. Thankfully, that’s when they’re in season and when we need them most. Oranges add flavor to a variety of foods, especially if you take advantage of the zest. Recognized for their health benefits, they contain vitamins B and C, fiber and potassium. The variety of oranges available has increased dramatically; here are a few to taste this year. Known as the tiny versions of regular oranges, clementines are in season from mid-November to January and have glossy and smooth skin. Seedless and easy to peel, clementines are the perfect on-the-go snacks. Their refreshing flavor is mild with tart, tangy and sweet notes. Tangy with hints of vanilla, blood oranges were only available as imports from Europe, but now they’re grown in California. Known for their dark orange to red flesh, blood oranges have a tart taste. Consider using blood oranges next time you make mimosas. Part of the winter citrus family, this orange variety gets its name from its underdeveloped fruit on its opposite stem that resembles a human navel. These oranges are seedless, peel easily and contain acidic, rich and sweet juices. A relatively new variety in the United States, Cara Caras were named for the ranch in Venezuela where they were developed. They have a delicate pinkish-colored flesh and are sweeter than navels with a gentle note of grapefruit. Many believe Cara Caras taste similar to fresh strawberries or raspberries. A variety of the Mandarin orange, tangerines are most abundant in the months of November, December and January. 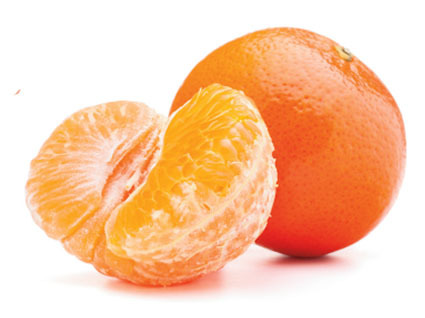 Tangerines are less sour than regular oranges and are known for their uniquely sweet taste. When ripe, they are firm to slightly soft and peel easily.